The Chase Iberia Visa Signature Card currently has an Informr score of 9 out of 10. This score is based on our evaluation of 4 sources including reviews from users and the web's most trusted critics. Chase Iberia Visa Signature Card is typically available to those with excellent credit scores (650 or greater). 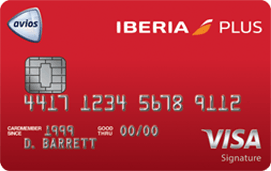 You might enjoy the Iberia Visa Signature card if you’re a frequent flyer between the US and Spain. You can earn accelerated points on Iberia, British Airways and Aer Lingus flights. You can also get a generous discount on two tickets if you hit the calendar year spending requirement. Get up to 100,000 bonus points when you sign up for this card and complete spending requirements, and you also have the chance to earn a $1,000 discount voucher applicable towards two plane tickets. Overall, because of all the lucrative benefits that it offers, this a great new product from Chase. This card is best suited for someone who travels internationally at least once a year and will spend more than $30,000 a year on this card. If you can hit that yearly spending goal, you’ll get the $1,000 voucher as well as more than 30,000 yearly points. A good card for earning rewards for Iberia, British Airways, Aer Lingus, LEVEL and OpenSkies travel purchases. It also offers one of the best bonuses of any airline credit card. - On purchases within the first 3 months. - Plus 25000 points after spending $10000 within your first year. On Iberia, British Airways, Aer Lingus, LEVEL and OpenSkies purchases.